Well, here we go The Voice fans. The Season 10 Finale is upon us. As I have not been able to regularly follow the show this season, I have no idea who is the favorite to win. Do you? 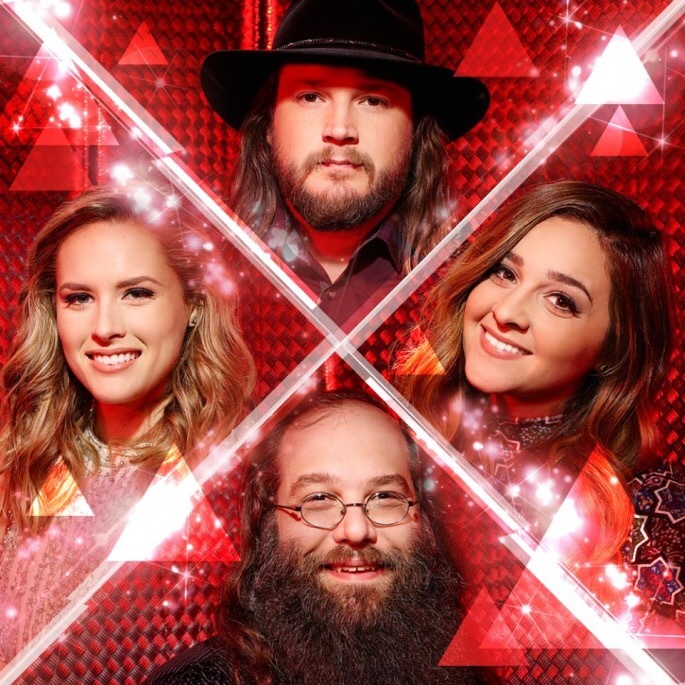 The four finalists, Adam Wakefield, Alisan Porter, Hannah Huston and Laith Al-Saadi, will perform for your votes and song downloads and everything else they may throw at us at the last minute to ensure a win. It is the Victoria Day weekend and I have a house full here so I will add the iTunes links for their songs later on this evening. Enjoy the show everyone. Catch y’all later. MasterClass Monday: Steven Spielberg Inspires Us To Listen To The Whisper. Well…it wasn’t the greatest finale ever! I liked Adam and Laith! I call Adam the winner!!! actually i thought they all did well. hannah did better than i expected. i don’t think anyone ran away with it. i was glad laith held his own. i don’t think his own song was as good as some of the others..it was ‘good, pleasant’, but not ‘wow’. i hope alison does not win. I flipped back and forth between DWTS and The Voice. Didn’t get to see every song. Of the songs I did see, some I liked more than others. Loved Hannah’s version of Every Breath You Take. I liked it too Louise. Not more than the original but as a vehicle for her voice, it was very nice. Didn’t like her duet and her original wasn’t my taste either. She has a big hill to climb to overcome Alisan and Adams iTunes multipliers. I admire what she has done this season though. As a true amateur in a field of professionals she has been very competitive. I always enjoyed seeing what she would do from week to week. I thought Laith had a good night. Adding some Clapton to his repertoire was a great way to wind up a season that featured BB King, Jimi Hendrix, Albert King, The Beatles, The Stones,Box Tops / Joe Cocker. This guy was my dream contestant. His original song was decent as well and his duet with Adam was outstanding! Alisan should be a strong contender for the win but even though she sang song after song that are old favorites her constant over singing and lack of nuance never made the sale for me. I also tired of hearing her tale of self inflicted whoa. In all fairness. I thought she had a very solid night last night. Her original was pretty good, her duet with Christina was remarkably restrained for both singers, and her rendition of Somewhere was very good except that she got a little carried away at the end. I even noticed a little bit of Streisand-esk tonal quality / pronunciation on two lines in the song. Given my complaints withe her, this was her best night of the season. Adam was under whelming for me last night. He has a habit of loosing his enunciation on the last half of every line. It’s what bar singers do when they can’t remember the words to all of the songs in their set list. I wish he had left Vince Gill out of his song selection. Some of it was good but it didn’t suit his style very well. He will be a strong contender due to the Blake / Country /iTunes factors. Good comments, Gene. Even though I like Adam’s voice, I’ve also noticed that I can’t always understand what he is saying. I also thought Alisan was good last night. And, of course, I like Laith, but am sure he won’t win. Thought the weakest song of the night was Pharrel and Hannah duet, mostly because I wasn’t impressed with Pharrel. I am definitely expecting the final two to be Adam and Alison, and am still predicting an Adam win. I enjoyed Laith and Joe Walsh and Alisan with Jennifer Nettles. Laith, Alisan and Hannah’s call back groups were good. I thought Adam was the only one in his group with the appropriate vocal style for his song selection and wondered why he didn’t play the B3 on a Spencer Davis Group song. The results were pretty much as expected I guess. I hope each of these artist continue to learn and grow in their craft and enjoy great careers. I can’t be too unhappy with the DWTS outcome either. Nile was incredible this season with a huge challenge to overcome. No sympathy votes were needed, he earned the coveted mirror ball on his dancing ability. I really enjoined Paige more than any other contestant this season though. Ginger did good work this season as well. I was just as surprised as Allison when her name was announced. I thought for sure the country guy would win. As I watched the voice last night, I thought how off this year was! From the get go, the buzz was a Christina win! The rest of the competition played in her favor, some great singers went home early. Then the crazy Twitter save, for the top four, by all Twitter shares and iTunes downloads, Mary Sarah should have taken someone’s spot in the top four…and then last night reading all of the “after” buzz, Laith should have placed higher! I get the feeling that contestants are voted through more times because of their coach, I think Christina could have had Minnie Mouse on that stage and her fans would have made her win happen. I say this with no pony in this race, while I did like Adam, he didn’t blow me away, I liked Mary Sarah’s audition, but she failed to keep that momentum. I liked Hannah’s bring back song the best last night. I liked Pretty much all of Laith’s songs! I was happy too with Niles’ win! Glad I didn’t bet any money on The Voice because I was sure the voters would prefer Adam. DWTS’s results did not surprise me. Nyles was so impressive, but I did feel sorry for Paige . She deserved to win too, but there was no way to compete with a deaf guy with incredible dancing skills. I had seen on Twitter that Adam Lambert was heavily promoting Alison…turns out she co-wrote the song aftermath with him! So how many Glamberts voted without watching the show?!?!?! Hmmmmmm!!! As a fan of The Voice, I would have much rather seen Chris Mann and Javier Colon sing songs from their new albums, Cassadee Pope perform her soon-to-be new single “Summer” and Christina Grimmie sing any one of the four songs from her pop EP released earlier this year rather than some of these celebrities they had on the finale. The show needs to do more — much more — to promote past contestants not named Sawyer Fredericks and Jordan Smith. I liked Alisan when she sang in the lower part of her register. When she went for high notes, she becomes very shrill. There were a number of things that I didn’t like about Alisan, but one thing that really irritated me was that she sang three songs that were famously covered by Linda Ronstadt, and sang Linda’s arrangement of these songs, and gave her no credit at all. Yes Desperado was an Eagles song but Linda covered it shortly after their release of it and was very successful with it. Christina had the nerve to go on about how brave Alisan was to cover an Eagles song as if no woman had ever done it. Also, her blind audition with Roy Orbison’s Blue Bayou was patterned exactly as Linda had done it, with exception to the massive blast she added at the end.. I doubt that she would have ever heard of the song had Linda not had a big hit from it. Linda was the best selling female artist throughout the entire decade of the seventies, which is no small feat and now her voice has been silenced by Parkinson’s disease. It showed at best ignorance or at worst a lack of class to not give this landmark artist credit for her work. I expect Alisan to return to the stage as a musical actress. Yeah, Roy was great. I like the story of how he came to wear sunglasses all of the time. Okay Gene, do tell, I don’t know the sunglass story! In the early 60’s there were a lot of what were called “package shows” of popular American artist who were assembled by a promoter and taken on tour in England, European countries and some of them also toured Scandinavian countries. The black Blues artist were popular in the Scandinavian counties. This was at a time when if their music was known to white American audiences it was because it had been converted to a rock and roll song by a white American kid and then the British began doing the same thing and the rest is history, as they say. So anyway, Roy was on one of these package shows heading to England and realized he had been wearing his sunglasses when he boarded the plane in the US and had left his regular glasses at home.If you have never seen his glasses they looked like the kind that people had to wear after cataract surgery in that time period and before contact lenses. In other words, Coke bottle bottoms. So he was forced to wear the sun glasses at night on stage and anywhere else that he might be seen, he was wearing them. The British press made a big to do about the cool American cat in the dark glasses and from that they became sort of a trademark for him. It could be that they helped with dilated pupils and bright lights, but I wouldn’t know anything about that. Heads up; Daughtry is going to be on Live from Daryl’s House next Thursday. The Palladium Network is now an MTV secondary channel so some of you that didn’t have it in the past may have it now. You can also watch the shows on Daryl’s web site. Thank you Gene…that’s a great story, I had never heard that! I love back stories on the older artists, their stories seem to have more flavor than the artists today…Other than the idols, a lot of them have some pretty good back stories, some not so much!